RR International School, C.Pudupatti has advertised in the DINAMALAR newspaper for recruitment of Teachers PRT jobs vacancies. Interested and eligible job aspirants are requested to walk-in on 19th August 2018. Check out further more details below. 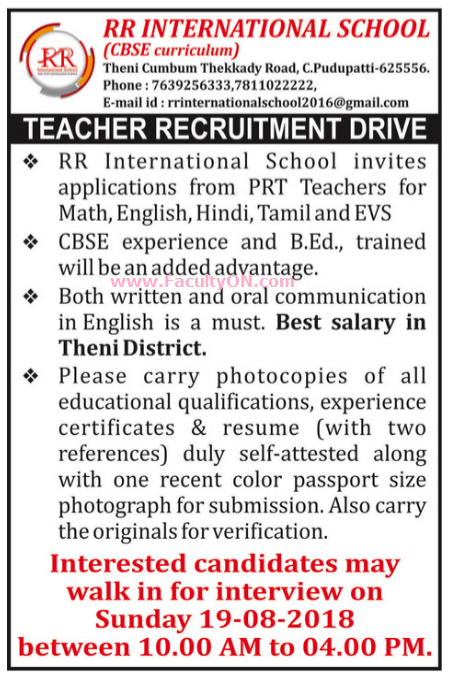 About School: RRIS has been established by RR Educational Trust. The school will be affiliated to Central Board of Secondary Education (CBSE) very shortly. We have Grades Kindergarten to Grade VIII as of now. The school has strength of 1500 students 90 qualified and experienced teachers and 45 non-teaching staff headed by an experienced Principal. The School is rooted in traditional values but modern in its outlook. CBSE experience and B.Ed trained will be an added advantage. Both written and oral communication in English is a must. How to Apply: Interested and eligible candidates are requested to attend the Walk-in interview with CV (two references), attested copies of certificates and one recent PP size photo for submission and also with all originals for verification to the walk-in address provided here.